We are proud to introduce the all-new 2019 Toyota RAV4! The sporty model has been completely redesigned for the model year and receives a new engine, a fresh new look, more safety and technology features and much more. Even the base model comes packed with a generous array of features, including Toyota Safety Sense 2.0, a 7-inch touchscreen, Apple CarPlay, a six-speaker sound system, low-profile roof rails, a rearview camera and much more. In fact, 2019 has made the RAV4 even more competitive and capable to take on the strongest competition. To best showcase all the RAV4 can do, we have put it up against the 2019 Ford Escape. Here's a closer look at how the two models compare. 69.8 cu.ft. Max. cargo volume 68 cu.ft. 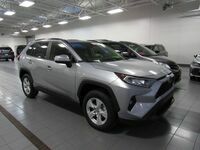 Test drive the new 2019 RAV4 at Le Mieux Toyota today! Ford’s new Escape offers generous cargo space, quick acceleration and dynamic handling thanks to the SUV’s spirited engine options. That said, the 2019 Ford Escape struggles to complete with the 2019 Toyota RAV4’s more powerful engine and spacious, high-tech cabin. No matter where your adventures take you, the 2019 Toyota RAV4’s impressive handling and versatility will make every journey more exciting. Most importantly, the RAV4 keeps passengers comfortable and entertained along the way. Every RAV4 model also comes equipped with a long list of safety technologies for added peace of mind. 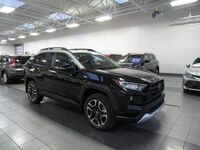 We invite you to see the 2019 Toyota RAV4 for yourself with a test drive at Le Mieux Toyota. Our award-winning team of experts can answer any questions you might have and help you find the perfect vehicle for you. Stop by and see us today!